Hanging in the atrium on the first floor of Library East is an acrylic on canvas painting titled High Five. It is part of Florida Gulf Coast University’s public art collection. But this work was not commissioned or acquired under the Florida Art in Public Buildings Program (Fla. Stat. s. 255.043). 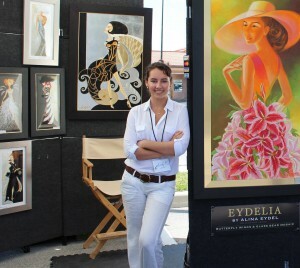 Rather, it was a gift from recent graduate Alina Eydel, who received her Bachelors of Arts from FGCU in 2011. “The painting was inspired by FGCU, so I wanted the university to have it,” Eydel states. The painting is a study in metaphors. 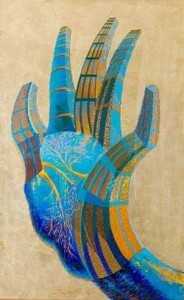 Each finger is a skyscraper; the heart line, head line and life line bisecting the palm are formed by golden trunked trees. 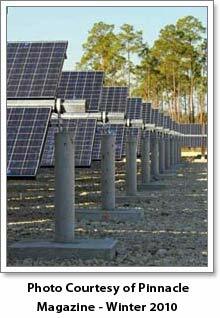 “The campus is in the middle of an eco-preserve,” explains Eydel. 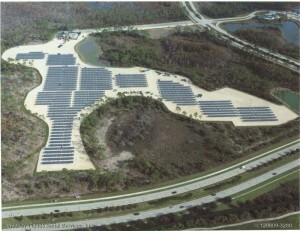 And its 15-acre solar farm produces approximately 85 percent of the energy needed by the university to operate its Engineering and Business School buildings, as well as the Arts and Sciences’ laboratory and classroom building, AB#7. 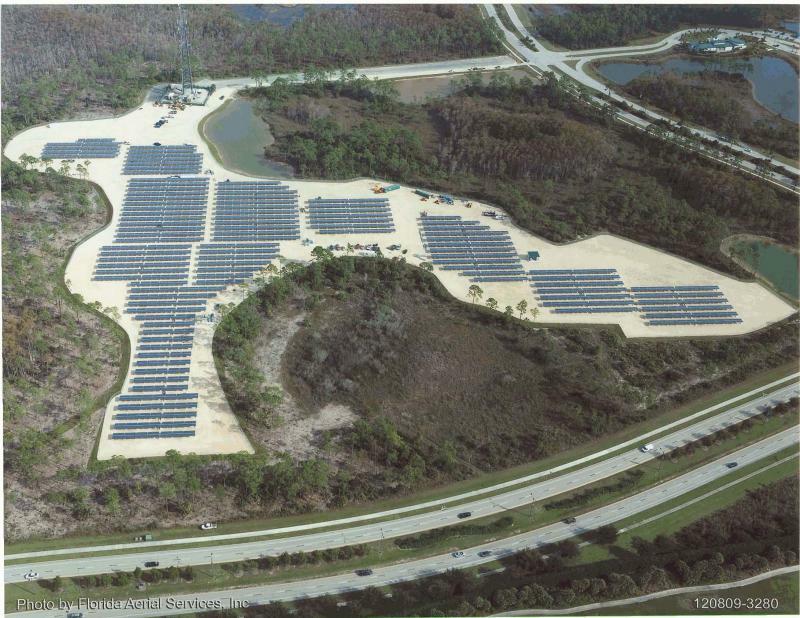 Tilting and rotating throughout the day as they track the sun, the solar panels generate 2 megawatts of energy per day, saving FGCU an estimated $22 million over 30 years. 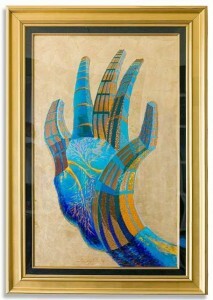 Eydel contrasts the powerful raised hand against a gold leaf background to express yet another metaphor. 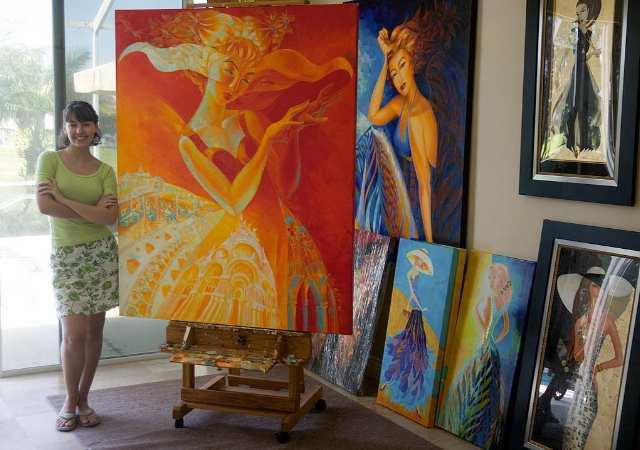 “It is a blend of American and Russian Orthodox iconography,” Alina reveals, alluding to the fact that while her strength and passion are unquestionably American, they bear the pervasive influence of her Russian background. Not that Alina remembers Russia. She was but 2 years old when her parent left Kiev during the collapse of the Soviet Union. But her mother (an interior designer) and father (a graphic designer) have encouraged her artistically since she could hold a pencil, and later a paint brush, and have passed along their own classical art training to their impresario daughter. It is also interesting to note that Eydel included two of the FGCU’s school colors in High Five, namely cobalt blue and old gold (leaving out only emerald green), although the artist maintains that the color palette was purely coincidental. 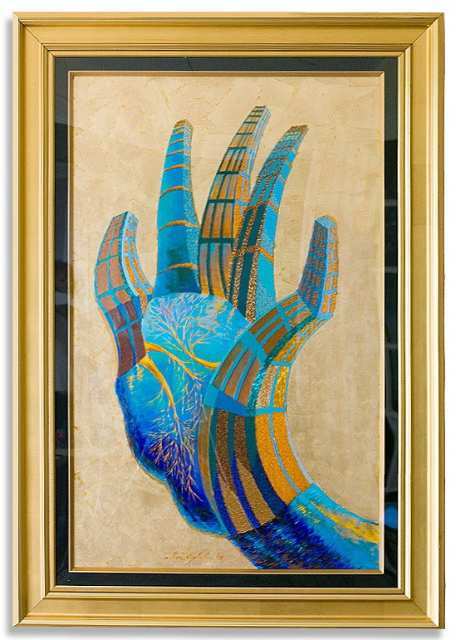 High Five is one of a limited number of paintings that evolved from Eydel’s 2009-2011 Precious Balance series. 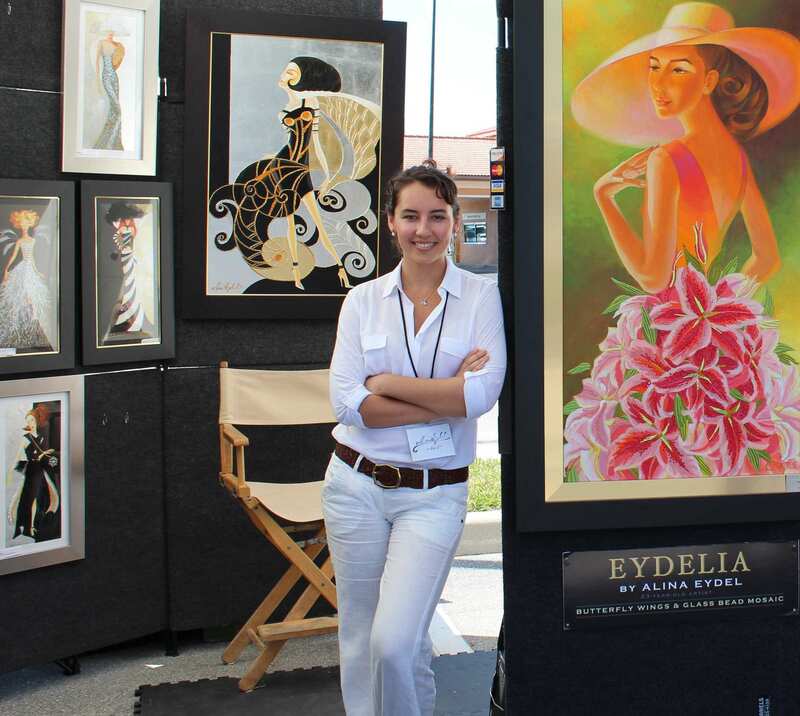 It was a personal favorite of both the artist and her mother, Lana, and included in Eydel’s Precious Balance exhibition at the Sidney & Berne Davis Art Center in the downtown Fort Myers River District. Eydel uses this designed contrast to convey both an intellectual and visceral message. 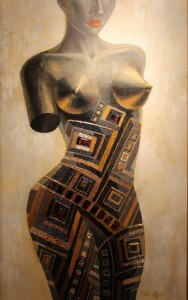 The goal of Eydel’s figurative work, for example, is to draw attention to ethereal and eternal qualities such as harmony, health and the preciousness of the human body, a point she underscores by using semi-precious materials to transform torsos into metaphors for treasure and suggest the body is a priceless vessel that demands to be cherished and protected. 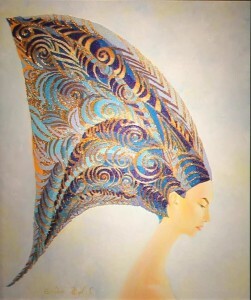 Her paintings also possess an intriguing Byzantine iconic edge. 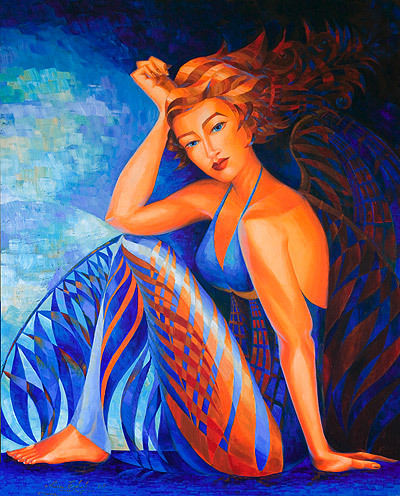 The flat, almost two-dimensional texture-filled geometrical shapes and abstract patterns that dominate the bulk of her compositions also serve as juxtaposition for the faces, hands and feet of her figures. The latter seem to jump off the canvas with a depth, dimension and animus informed by shadows, shading and Eydel’s adept blending of flesh tones. This contradistinction is homage to the technique of inverse perspective in evidence in many 15th Century Byzantine iconic paintings and mosaics. 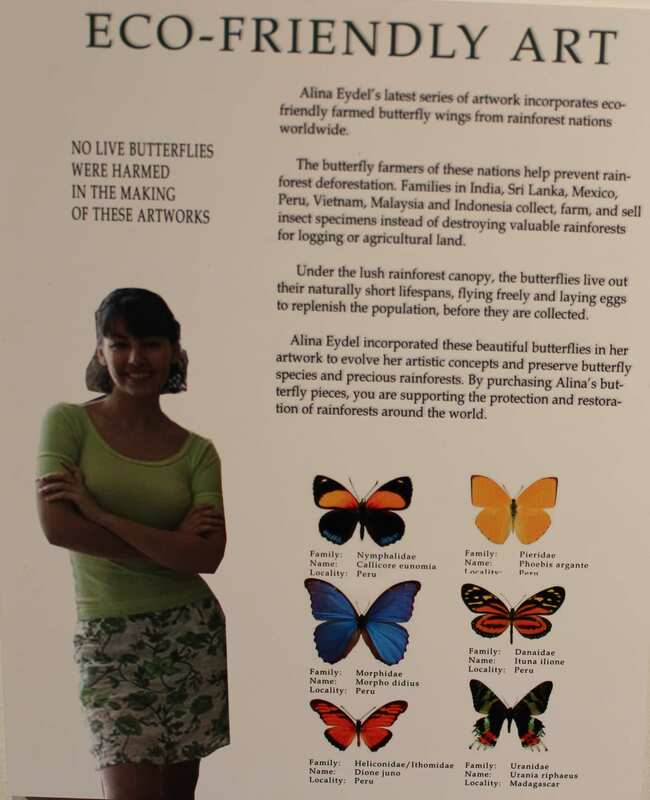 “I exaggerate the contemporary perceptions of aesthetics and synthesize them with my own impressions and experiences, especially from traveling and observing nature,” states the 22-year old. “I further explore elegance and femininity using the ancient idea of mosaic,” an idea she got from the floor-to-ceiling Murano glass mosaics in St. Mark’s Cathedral in Venice during a trip to Italy when she was 13. 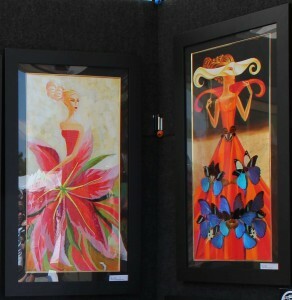 In Love (left), Eydel also uses beads to represent the moments of our lives. “Each conversation, each touch turn into mosaics of moments,” Eydel sagely observes. The bead work also infuses the composition with a distinctively meditative quality. Many of her works express mantras. 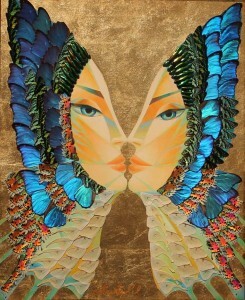 Prosperity, health, balance and love are frequently incorporated into the themes Eydel expresses. 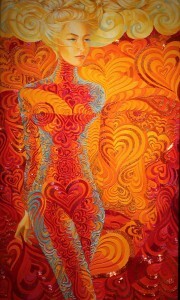 “Painting brings love into my life, and simultaneously expresses the love in my life. I’m fiery and passionate when it comes to love.” Which Eydel signifies through the vibrant red, orange and gold color palette she uses in the composition. 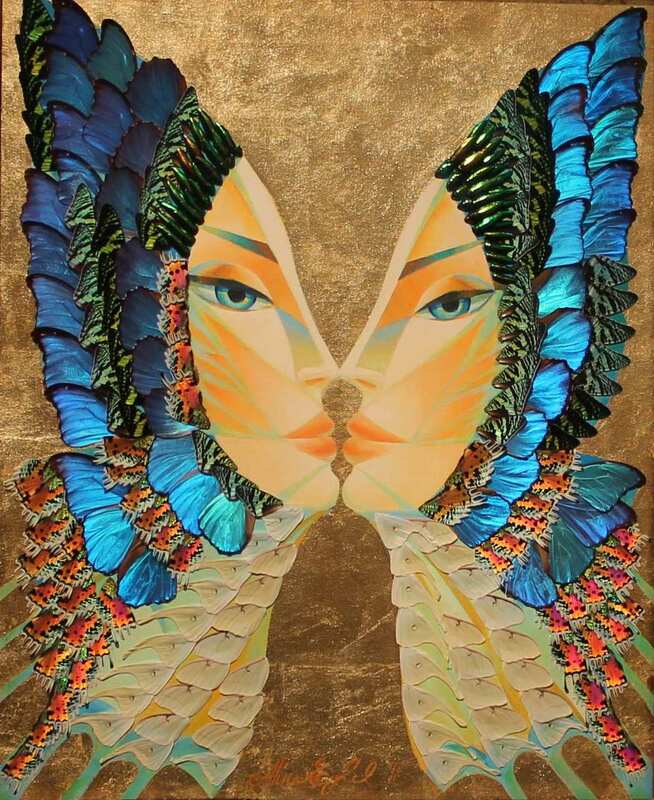 Whether beads, crystals or butterfly wings, the delightfully surprising materials and textures that Eydel uses in her canvases transform the works into painted pieces of jewelry, prompting Eydel to refer to her paintings as jewelry for walls or mosaics on canvas. “Such a multidimensionality of texture is intrinsically surreal; each piece is both a painting and jewelry at once,” Eydel writes. “Each piece is also a painting and a mosaic at once.” This duality corresponds to her iconography, in which a dress or a hand or a torso or a flower is not just what it is, but also a symbol for something else entirely. 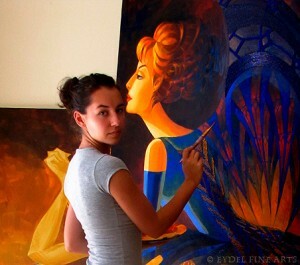 Eydel is classically trained and employs those rigors in the creation of her canvases. As expected, she begins each composition with a painstaking sketch. She then paints the imagery as she would a regular acrylic piece. 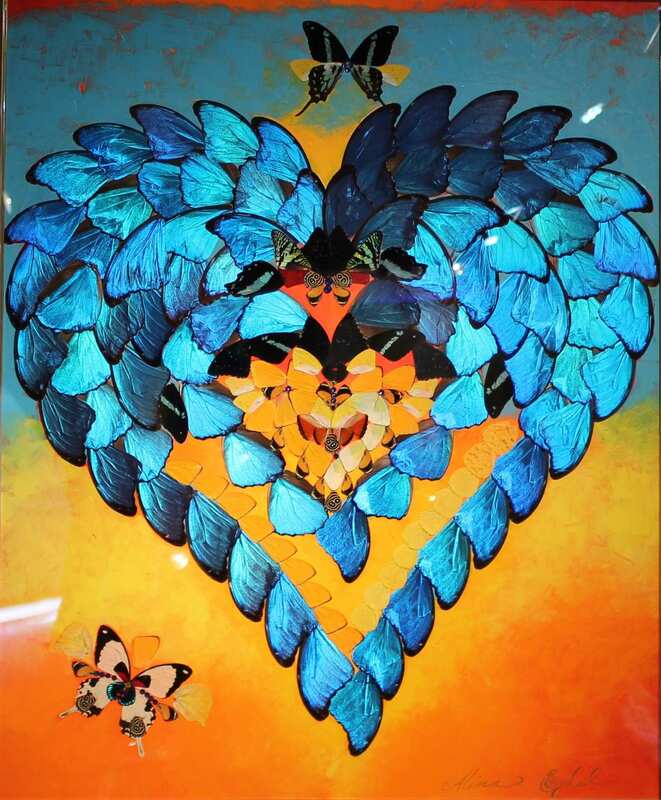 But then she glues mixed media materials such as beads, crystals, precious stones and butterfly wings onto the canvas using tweezers and a special acid-free adhesive. Once the mosaic on canvas is complete, it is varnished and left to dry. Igor and Lana also began saving her prodigious work. When Alina turned nine, Igor made a website for her daughter. 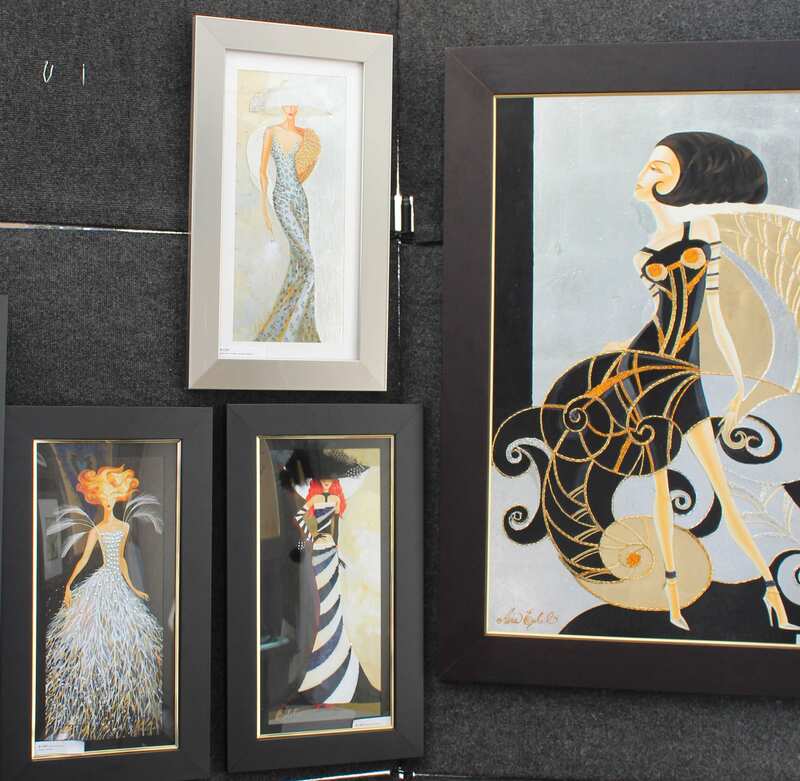 “It attracted my first collectors.” By the time she was 10, Igor and Lana had amassed enough artwork to enable their daughter to begin exhibiting, and she experienced her first solo exhibition in 2000 at SOHO La Gallery in Los Angeles. The following year, she enjoyed solo shows in Laguna Nigeul and Laguna Beach, and two years aft that she began producing a nautical collection for Princess Cruise Lines. “I went on a cruise to Tahiti with my parents,” Alina explains. 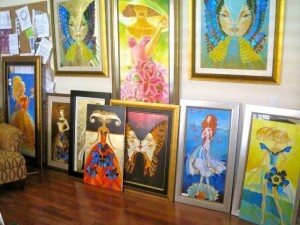 “They had a great art program on board and at the suggestion of the art director, I submitted my portfolio to the cruise line.” Not surprisingly, Princess loved it. 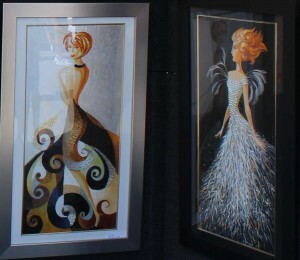 Today, her paintings are also sold at auction aboard Cunard, Holland America and Disney. 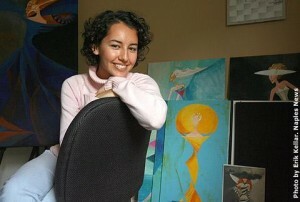 Her immediate plans, however, include exhibiting at Art Miami in December during Art Basel and participating in the Artists’ Studio Tour planned by the Patty & Jay Baker Naples Museum of Art for March 3-4, 2013. She was represented in 2012 by Prominent Gallery at ArtNaples Contemporary Art Fair and Art Sarasota, and also hopes to participate in both of those international are fairs in 2013 as well. Many historians believe that Los Angeles Dodgers Dusty Baker and Glenn Burke exchanged the very first high five. It happened on October 2, 1977 in Dodger Stadium. It was the last day of the regular season, and Dodgers leftfielder Dusty Baker had just gone deep off the Astros’ J.R. Richard. It was Baker’s 30th home run, making the Dodgers the first team in history to have four sluggers — Baker, Ron Cey, Steve Garvey and Reggie Smith — with at least 30 homers each. It was a wild, triumphant moment and a good omen as the Dodgers headed to the playoffs. Burke, waiting on deck, thrust his hand enthusiastically over his head to greet his friend at the plate. Baker, not knowing what to do, smacked it. After retiring from baseball, Burke (who was one of the first openly “out” homosexual professional athletes) used the high five with other homosexual residents of the Castro district of San Francisco, where for many it became a symbol of gay pride and identification. 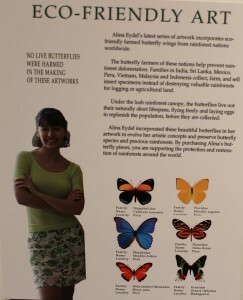 High Five is not the first artwork that Eydel has given to an educational or charitable organization. “I donate to the Make-A-Wish Foundations and various local charities, such as Arts for ACT in Fort Myers. 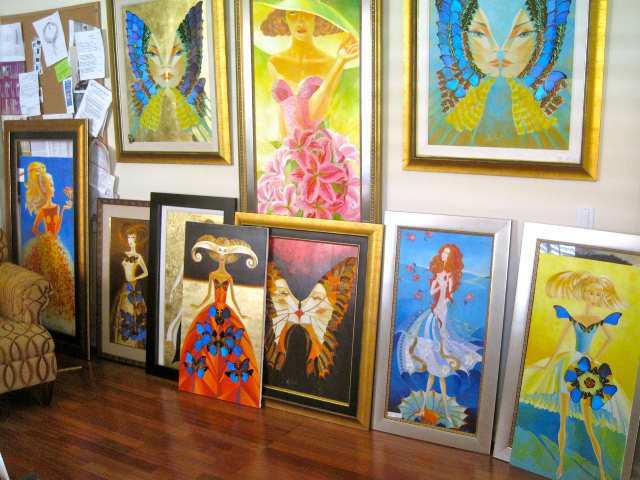 I think I’m pretty blessed with lots of good things, so I feel I have to give back to the community and to those who ask,” said Eydel. 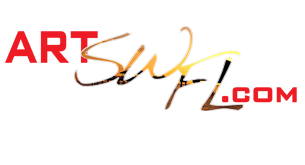 Swarovski crystals are precision-cut glass which is made by a company based out of Wattens, Austria by the name of Swarovski AG.